Created on 2019-03-29.17:01:44 by nicoe, last changed by reviewbot. It's probably related to the browser you're using. I have the issue in chromium but not in firefox. event effectively stopping the drag'n'drop. I am still investigating this issue. 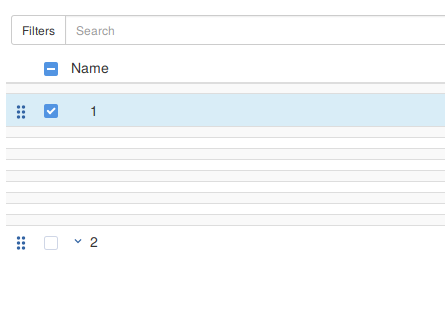 In editable lists, when you create a record, it is not associated with the selected record, but with the top level. The arrow that opens the tree is not hidden when the last leaf of the tree is moved. Like the GTK client sao could have support for drag and drop. After some investigation it seems like https://github.com/SortableJS/Sortable would be a suitable library to add drag'n'drop to sao as it's a minimalist library. An issue I have identified is the fact that in Tryton in case of a drag'n'drop in a tree the client will open the node with children. In sao it would imply an RPC call that would in turn reconstruct the tree and break it. The option we have chosen to implement is to add a transient line that mean "drop into the node".